If you’ve never grown plants in your aquarium before, getting started in the world of planted tanks can be a little intimidating. Not everyone has a green thumb, after all! Luckily, there are tons of beginner friendly plants that also look amazing in any aquarium. Java Fern is a common species that you might have come across during your research. This versatile aquatic fern makes a beautiful addition to any aquascape and is entirely suitable for beginners (as well as experienced aquarists looking for something uncomplicated, of course). Microsorum pteropus, also commonly known as Java fern, is an aquatic plant known in the aquarium hobby for its undemanding nature. In the wild, you’ll find this fern in Southeast Asia, where it grows in countries like Thailand, Malaysia, China and the Philippines. Its appearance varies between all these locations, which means there are different leaf types and growth patterns to choose from that all fall under the species ‘Microsorum pteropus’. Java fern is a rhizomatous plant, meaning its leaves and roots grow from a thick horizontal stem. This way of growing is often seen in plants that have adapted to grow outside of the soil, as is also the case with Java fern. Instead of growing in dirt it has evolved very strong roots that allow it to anchor onto pretty much any porous surface. Its roots are only meant for this anchoring: they don’t absorb any nutrients, that’s done by the leaves instead. Java fern is widely appreciated by aquarists mostly because it’s a great option for low-tech aquascapes. It doesn’t need much light to thrive and won’t require the set-up of a Co2 system or extra nutrient dosing. All this makes this plant perfect for beginners as well. It’s one of the species we recommend to those just getting started with aquatic plants not just because of its easy care, but also because it’s very versatile and pretty much nearly indestructible. Its hard leaves are unattractive to herbivorous fish and it won’t easily wither from a few beginners’ mistakes. If you’re looking to master the art of growing Java fern, keep reading. Although this is an easy plant, it does of course have a few requirements to thrive. We’ll describe all of its needs in detail below, starting with a short discussion of its natural habitat in Southeast Asia. An easy way to help figure out how to care for a plant in our aquariums is to have a look at its natural habitat and see how we can imitate it. Rather than rooting in the substrate it attaches itself to rocks and other surfaces using its very strong roots. This keeps it from being swept away by the current if the river or stream it grows by swells during the rainy season. 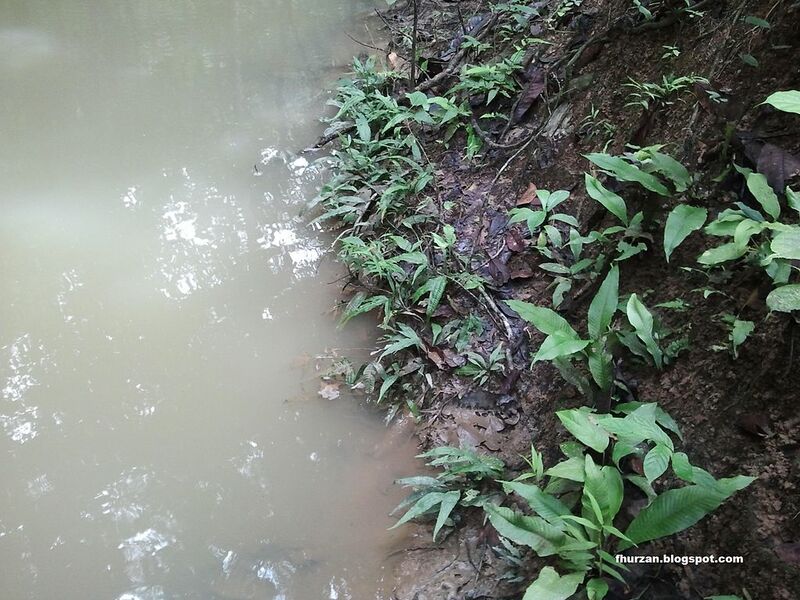 Java fern has adapted to living both under and above the water surface, which also comes in handy for the species as the water levels of the rivers in these areas can vary greatly. In our homes it means you can grow it both submersed and emersed! Do keep in mind that it’s not adapted to drying out, as it grows in the spray zone in the wild which keeps the leaves at least lightly moist at all times. You won’t need much to successfully grow Java fern in your own aquarium. In most cases it’ll thrive without much intervention on your part as long as you follow its basic care requirements. Some aquarium plants need a lot of light to thrive. As we’ve briefly discussed before, Microsorum pteropus is not one of them. It will do just fine with a basic cheap LED light or the light your aquarium came with, so there’s no need to purchase fancy lighting equipment in order to grow it. In fact, too much light can actually case problems with this plant, as it can fall prey to algae or leaf scorching. If there’s one thing that you shouldn’t worry about too much when it comes to Java fern it’s temperature. This plant can thrive in a very wide range (60-83 °F / 15-28 °C, and that’s probably putting it conservatively). This means it’s not just perfect for tropical tanks, but also one of the plant species that will do well in an unheated aquarium. Perfect if you’d like to keep subtropical fish like paradise fish, danios or fancy goldfish. Again, don’t worry too much about this. Unless things are really extreme your Java fern probably won’t care too much about the specific water parameters. The waters it naturally occurs in are relatively soft and acidic and it’ll grow fastest in these conditions. However, harder water with a higher pH shouldn’t be much of an issue either. This species can even take a salinity of up to mid-end brackish! If you want to enjoy Microsorum pteropus to the fullest it’s a good idea to grow it in an aquarium of at least 10 gallons. Not necessarily because the plant cares too much about tank size, but simply because of its size. It can grow quite tall and wide, which means it might outgrow a smaller set-up unless you prune very regularly. An exception to the 10 gallon rule would be Microsorum pteropus var. ‘Petite’, which was selectively bred for its smaller size. Like all aquarium plants, Java fern will appreciate receiving extra nutrients in the form of added Co2 and a regular fertilizer dosing schedule. The nice thing about this plant, though, is that these things aren’t a must. In most cases you get away with not dosing anything extra just fine. Microsorum pteropus is a plant that hasn’t evolved to grow in substrate. This means its roots aren’t adapted anchor it in dense materials like sand or dirt. In fact, in most cases they’ll suffocate and die off if you plant your Java fern in the aquarium substrate, often taking the entire plant with them. Instead, the strong, brown roots of this plants are meant to firmly attach it to surfaces like rock and wood. As we’ve discussed, this keeps it from being swept away when the rivers it naturally grows by swell during the rainy season. This unusual way of growing poses advantages and challenges to us fishkeeper. A challenge is that you’ll have to find a surface to attach your Java fern to and then make sure it sticks until its roots have taken hold. A tube of superglue or some fishing wire does wonders for this. Material-wise, you’ll want to go for something porous like lava rock or textured driftwood to give the roots plenty of anchoring points. An advantage of the way Java fern grows is that you can use it in ways that don’t work with other plants. Java fern trees, Java fern walls and more! We’ll describe the various ways to display Java fern in your tank in the paragraph ‘Java fern uses’. If you don’t want to go through the hassle of glueing or tying your plant to its anchor point yourself, you’re in luck. Many stores sell pre-planted Java fern attached to all kinds of rock and driftwood. This comes with the added advantage of the plant already being rooted and established, which means it won’t easily accidentally come loose and is ready to start growing. Once your Java fern is attached to some rock or driftwood and submerged in your tank it’s ready to start growing. Don’t get too excited: this isn’t exactly the fastest plant when it comes to increasing in size, especially if you’re not adding Co2 or dosing nutrients. It needs some time to establish itself and even after that its growth will usually be pretty slow. Java fern requires pretty much no maintenance. There’s no need to prune it unless you feel the need to do so yourself. The only thing you might have to do is remove a few dead leaves now and then. These are not necessarily a sign your plant is doing badly unless there are a lot: leaf decay just happens with plants. This species can reach quite the size and become very impressive looking with time, making it the perfect addition to your aquarium if you don’t mind waiting a little for the jungle look to develop. So which ways to enjoy Java fern in your aquarium are there? This plant is very versatile, not in the least because of the various types out there. You’ll love working with it. As with all live plants, your fish will love Java fern. Its tall leaves offer cover and make a great place for skittish fish or fry to hide. The textured leaf surfaces are home to a layer of biofilm, which any (dwarf) shrimp will happily consume. Additionally, all live plants help keep your aquarium stable. They don’t make water changes unnecessary, but they do help keep your water parameters where they should be between maintenance rounds by using compounds like nitrate and phosphate as food. These are harmful to fish in higher quantities, so your stock will appreciate the work the Java fern does for them. If you’ve ever kept herbivorous fish like (fancy) goldfish and some types of cichlids, you’re probably familiar with the nightmare of newly bought plants ending up as expensive fish food. Luckily you don’t have to give up on your idea of a planted tank! If you touch Java fern leaves you’ll notice they’re quite tough, hard and almost leathery. Pretty difficult for a fish to rip apart, and in addition to this it has also been theorized that they just don’t like the taste. Even ever-hungry goldfish will pass up this plant in search of tastier treats. There is still a bit of debate on whether Java fern can thrive in a brackish aquarium. Most sources say yes, but others insist that it’s not possible and the plant will die off sooner or later. Now, we’ll have to admit that we haven’t done any scientific research. After reading other aquarists’ experiences and trying it ourselves, though, we feel confident in saying that this plant will at least survive and usually even grow in low-end brackish water. Mid-end we’re not sure about – lower salinity offers a better chance of success – but you can always try it if you’ve got some Java fern cuttings handy. 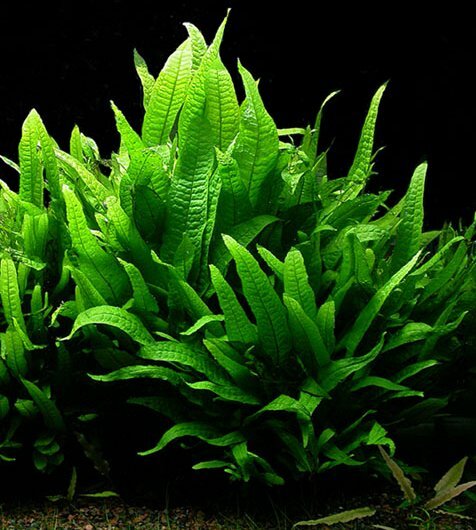 Java fern is a popular plant in the aquascaping hobby, especially among those that like to maintain low-tech aquariums without any fancy equipment. Its growth pattern is very decorative and the fact that you can attach it to rock or driftwood makes it the perfect plant if you’d like to get creative. Due to its height, Java fern is usually considered a mid- or background plant depending on the size of your aquarium. That being said, the best placement depends on the variety you’re working with. For example, you’ll notice that the ‘Windeløv’ variety has a more fan-shaped growth pattern than regular Java fern, making it a good mid-ground option. Of course you can just attach your Java fern to some rock or driftwood and strategically place that in your tank for a fantastic look. If you really want to get creative, though, why not make a Java fern ‘tree’? All you need to create one is a nice piece of driftwood that imitates the branched appearance of a tree, as well as some Java fern of the right variety. Avoid anything with long leaves like ‘Narrow’ or regular Java fern for the best effect. Instead, try going for ‘Windeløv’ or ‘Mini’! Simply attach the plant to the top of your driftwood and voilà, you’ve got your own Java fern tree. Are you in need of some serious jungle effect in your aquarium? How about an entire wall of Java fern at the back of your tank? Because Java fern can grow on almost any surface it can be attached to mesh to create a beautiful green background. If you want to make your own Java fern wall, it’s best to start by making the back pane of your aquarium black using some cling film. This ensures you won’t be able to see the mesh you’re using to attach the plant to. Get your Java fern and break it up into enough little pieces to cover most of the mesh. Don’t worry if things are still looking a bit sparse at this point; the plant will fill in with time and cover all of the mesh. Next, attach the whole thing to the back wall, making sure no clumsy fish can get behind it and hurt themselves. That’s it! All you have to do now is sit back and wait for the plantlets to grow and reach their full decorative potential. As with pretty much everything when it comes to Microsorum pteropus, propagating this plant is very easy. Divide it freely to fill up all your aquariums, give to fellow fishkeepers or even sell it! You can find two ways to propagate your Java fern below. Probably the easiest way to multiply a Java fern plant is through rhizome division. If you read the introduction you might remember that we explained that this plant is rhizomatous, meaning its leaves and roots grow from a thick, woody and almost root-like base. This base grows horizontally, creeping slowly and putting out leaves and roots in the process. The handy thing about the rhizome is that every part of it has the ability to keep growing. Even pieces of rhizome that have no roots or leaves whatsoever attached to them are often still viable if you’re patient enough. To propagate a Java fern by rhizome division, simply snap or cut the rhizome to remove a piece of plant of your desired size. Seriously, that’s it. Attach the new part to another surface and both pieces will continue growing just fine. Even if you don’t make any efforts to propagate your Java fern a healthy plant will go ahead and simply do so itself. It will produce tiny plantlets on the tips of its leaves, complete with a little root system and a leaf or two. In the wild, these plantlets are knocked off the mother plant by the water current, animal activity or even the wind. They end up on the ground and root there, becoming entirely self-sufficient new plants. In our aquariums, Java fern plantlets come loose when you touch the plant or by the flow of your filter. They usually end up stuck to the filter intake or floating around, allowing you to easily collect and re-plant them. Although Java fern is suitable for beginners and will do well in most cases, it can get a little finicky when something is off. If you’re seeing a greater amount of leaf browning than usual or if your plants’ leaves are showing yellowing or other discoloration, something might be going on. Keep in mind that Microsorum pteropus will always feature some degree of browning on the leaves. This is nothing to worry about and actually normal: the brown dots are the spots that plantlets can grow from. It’s not until leaves are entirely brown and come off easily that they’re dead and indicative of a possible issue. Below we’ll go into the two most commonly seen problems with Java fern. Seeing your Java fern’s leaves develop yellow spots or melt/rot away completely? As we mentioned before nutrient dosing is not necessary for this species in most cases, but sometimes there is just too little to go around. Consider dosing a liquid aquarium plant supplement – doesn’t have to be anything fancy, just something to provide a little more of what this plant needs. Leaf death, with leaves browning or turning transparent and coming off, can be a sign that your aquarium lights are scorching your Java fern. This plant naturally grows in forested areas that don’t receive much direct sun, meaning it’s not used to being blasted with light. Move the plant(s) to a more shaded spot in the aquarium or try turning the lights down a little bit. Java fern is a very popular aquarium plant and you should be able to find it in most pet- and aquarium stores. Most only carry regular Microsorum pteropus, though, so if you’d like to grow any of the selectively bred cultivars in your tank you’ll probably have to turn to the Internet instead. Luckily there are many sellers out there with great selections. Their plants are often a little healthier than those found in aquarium stores because they’re homegrown or fresh from the nursery and haven’t been sitting in the store for too long. Cultivating different varieties of Java fern seems to be a popular pastime for nurseries – at least judging by the sheer number out there. We’re not even going to try and describe them all, but we’ll discuss the most popular cultivars to hopefully help you choose the right one for your aquarium. Regular Java fern can be recognized by its long, ribbled and lance-shaped green leaves. It’s probably the most common variety out there. Microsorum pteropus var. ‘Windeløv’ leaves don’t look much like the original Java fern’s at all. This variety is also called lace Java fern because the tips of the leaves are finely branched. Microsorum pteropus var. ‘Narrow’ features, as the name suggests, much narrower leaves than the previous two species. It can be almost grass-like in appearance. Microsorum pteropus var. ‘Trident’ seems to be relatively uncommon in the hobby. It has an interesting leaf shape consisting of a thin leaf stem and then a thicker leaf that splits into very narrow ends. Microsorum pteropus var. ‘Petite’ is a small Java fern cultivar that looks quite a lot like the regular variety, just less big. A good option if you’re worried Java fern will outgrow your tank, although you should keep in mind that this one can still reach a reasonable height. Microsorum pteropus var. ‘Latifolia’ has broader leaves than most varieties.